Dark Matter Robot Blinks & Facebook Goes Home. Ben, Lyle and Bonnie cover the week’s news. Google is forking the Webkit rendering engine and calling this new fork “Blink”. Petman is designed to test chemical suites. Go ahead and watch the creepy video of this robot walking in a suite of clothing. 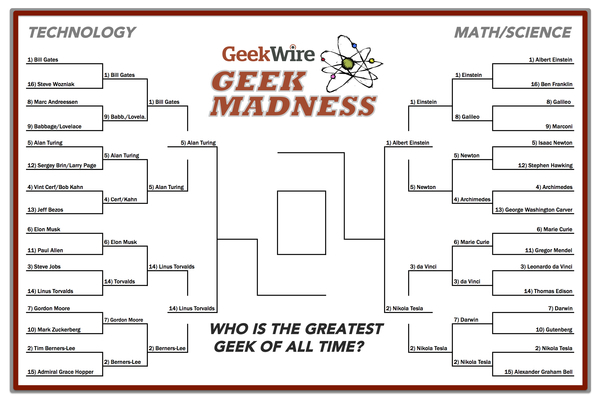 Final Battle - Who is the Greatest Geek Ever? GeekWire is running a popularity vote for the Greatest Geek Ever. Friend of the show and friend of mine Jim Warner from UCSC networking and all around geek has a great web page about the mobile coverage of the central coast of California. The CPUC will be conducting its third round of mobile testing at 1,200 points around the state starting April 8 and the CPUC Broadband Deployment Department is interested in generating some local press around the testing. We will be getting a schedule of where and when testers will be gathering mobile test data and are looking for any local media contacts you have who are interested in covering broadband deployment and Digital Divide issues in your community. We would like to coordinate some local news stories in concert with our mobile testing. A $2 billion particle detector attached to the International Space Station has detected the potential signature of dark matter annihilation in the Cosmos, scientists have announced today. The Alpha Magnetic Spectrometer (AMS) was attached to the space station in May 2011 by space shuttle Endeavour — the second-to last shuttle mission to the orbital outpost. Since then, the AMS has been detecting electrons and positrons (the electron’s anti-particle) originating from deep space and assessing their energies. By doing a tally of electrons and positrons, physicists hope the AMS will help to answer one of the most enduring mysteries in science: Does dark matter exist? And today, it looks like the answer is a cautious, yet exciting, yes. WebKit is a lightweight yet powerful rendering engine that emerged out of KHTML in 2001. Its flexibility, performance and thoughtful design made it the obvious choice for Chromium’s rendering engine back when we started. Thanks to the hard work by all in the community, WebKit has thrived and kept pace with the web platform’s growing capabilities since then. However, Chromium uses a different multi-process architecture than other WebKit-based browsers, and supporting multiple architectures over the years has led to increasing complexity for both the WebKit and Chromium projects. This has slowed down the collective pace of innovation – so today, we are introducing Blink, a new open source rendering engine based on WebKit. Google on Wednesday made a huge announcement to fork WebKit and build a new rendering engine called Blink. Opera, which only recently decided to replace its own Presto rendering engine for WebKit, has confirmed with TNW that it will be following suit. “When we announced the move away from Presto, we announced that we are going with the Chromium package, and the forking and name change have little practical influence on the Opera browsers. So yes, your understanding is correct,” an Opera spokesperson told TNW. This will affect both desktop and mobile versions of Opera the spokesperson further confirmed. Ben loves this book. If you’re a Star Trek DS9 fan, check this book out! The Kepler space telescope’s prime objective is to hunt for small worlds orbiting distant stars, but that doesn’t mean it’s not going to detect some extreme relativistic phenomena along the way. While monitoring a red dwarf star — designated KOI-256 — astronomers detected a dip in starlight in the Kepler data. The NASA space telescope is constantly on the lookout for these dips as they can be an indicator of an extrasolar planet passing in front of the star’s disk. This event is known as a “transit” and Kepler has the unprecedented sensitivity to detect sub-Earth-sized worlds drift in front of their host stars. The comet was discovered in September 2012 by the Russian observatory called International Scientific Optical Network—ISON—using only a 40 centimeter (16”) telescope. Like most comets, it’s a chunk of ice and rock a few kilometers across. As it nears the Sun the ice will turn directly into a gas, and it will shed dust to form a tail. As the dust and gas around it expand and reflect sunlight, the comet will get brighter, though exactly how bright is hard to say. Facebook has announced “Home” for Android smartphones (and, eventually, tablets). It’s something less than a full Facebook mobile operating system, as some expected before the company’s presentation, and more like an app update. Facebook also announced the Facebook Home Program, which will work with several carriers and device makers to pre-load Home onto select devices, including ones built by Samsung, Sony, ZTE, and Lenovo. The first “Home” phone will be the HTC First, a $99.99 phone that will ship April 12 from AT&T. Mobile devices such as smartphones and tablets have long been considered the future of computing and a new projection from market research firm Gartner shows just how important the mobile market has become. According to the firm’s estimates for 2013, Apple (AAPL) devices will outsell Windows devices for the first time this year. The estimate takes into account sales of Apple’s iPhones, iPads and Mac computers as well as desktops, laptops, tablets and smartphones powered by Microsoft’s (MSFT) various Windows operating systems. In 2012, Windows device sales totalled 175 million units while combined sales of iOS devices and Mac PCs reached 159 million. As The Financial Times noted, Gartner also projected that tablet sales will overtake traditional PC sales by 2015.